Confession: I totally fudged grafting the toe. Probably because I’ve never done the freaking Kitchener stitch before and after attempting it here I wanted to throw something out the window. Repeatedly. 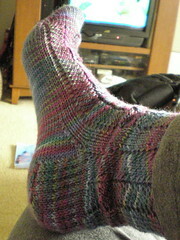 On sock two of two, I will take it to my LYS and beg them to teach me to Kitchener a sock toe properly. Learning and growing, learning and growing, I am a learning and growing knitter, right… new skills are important. 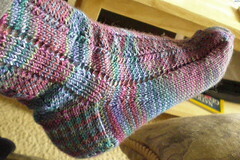 That said, I absolutely LOVE this heel and the pattern is really fast and fun, so the knit as a whole has been enjoyable. Speaking of wanting to throw things out the window? The Friday Night Knitter’s Club didn’t exactly go out the window, but it did hit the wall with a resounding smack. I was so disappointed. Anyone who has been wanting to read it, I will send you my copy for free if you want it, just drop a comment – it may be more to someone else’s taste than it was to mine! I’ve never read the book. Every time I read “sisterhood” as part of the description, I shudder mentally and put it down. I bought it on impulse. I’ve been pretty disappointed in the chick lit knitting genre overall. Alas, no exception this time. 😦 I wanted to like it, I really did. I was planning on reading it since Julia Roberts is planning on making a movie out of it. So if you wanna get rid of it, I’ll take it off your hands. I was “lucky” enough to get a copy straight from the publishing company about 6 months before it was released under the intention that I would leave a favorable blog post and pimp it out to all of my friends. Unfortunately I decided that I shouldn’t refer to the book as “steel magnolias but with yarn and less of a plot” on my blog so I just shut up. I think the book is currently being used as a doorstop. Great socks! Check out YouTube for “kitchenering” instructions. I’m sure there must be something there. Oh, there’s a nice little video of the Kitchener Stitch at this site. Look Under the heading “Finishing” and click on the video for “Kitchener Stitch”. Purty sock! Alas, knit lit makes me run the other way. Grafting isn’t so bad, it’s the directions that are crazy. Here’s another go at crazy: Each st on the knitting needles gets two passes from the sewing needle. The first time the sewing needle enters a stitch is opposite whatever it is (p the k sts, k the p sts) and the second time the sewing needle enters a stitch is the same, then the st goes off the knitting needle (k the k sts and off, p the p sts and off). If working in st st, that means that 2p (p front, p back and off) alternates with 2k (k back, k front and off).